The heat and humidity have finally abated, at least for a couple of days, and I’m looking forward to dyeing some yarn this weekend. 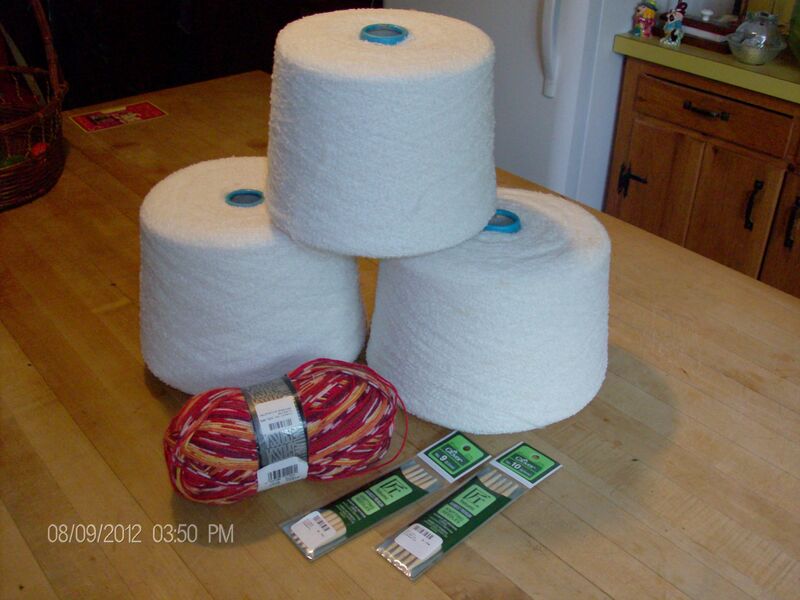 Last week I purchased 3 cones of boucle yarn from a lys at their going out of business sale. I am sad to see this happen, there is just something about being able to walk into a shop and feel the different textures, but I can’t complain about the prices I paid for the white yarn that will now become the basis of my first dyeing experiments. So, after I spend some time reading the Hand Dyeing Yarn and Fleece book by Gail Callahan I will begin turning these cones into skeins so that the fun can start. Last week my alum came in the mail, I have Kool-Aid in various unsweetened flavors, a Jacquard starter kit, black walnuts, lichen, birch bark, marigolds and red cabbage in the garden so I should be able to find colors with which to work. Right now my head is swimming a bit because I’m not sure where to start first, but I suspect that there will be some rather unique shawlettes entering my studio at ArtFire in the near future. The first hurdle I see is measuring the yarns so that I’ll know how much I have to work with of any one finished colorway. I think that my clock reel winder will come in handy. Will you be experimenting with your craft this weekend? « What color is in your yarn basket this week? I’m so sorry. I just can’t imagine.I really hope that you get everything settled soon.